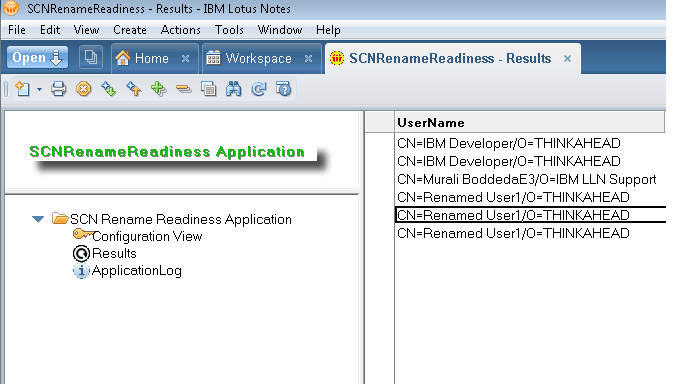 J Rajenderan and Shankar Venkatachalam have contributed a new project called User Rename Readiness Tool for IBM SmartCloud Notes. The tool helps to rename user names, for example when people got married, in both the on premises applications and IBM SmartCloud Notes. Below is the description from J Rajenderan and Shankar Venkatachalam. You can find out more by reading the documentation. "What is this tool and when is it to be used? This tool is programmed to look at the relevant on-premise artifacts and report back to the customer on the readiness for carrying out a rename for a selected user. This tool is to be run prior to a rename being carried out for a user by a customer, whereby the appropriate checks are made to the customer's On Premise artifacts to ensure that the rename does not fail at a later stage thereby, avoiding many PMRs and issues that we and customer's face on the rename issues and avoid getting them in the funky state they find themselves in today. Ensures that rename failures are avoided by pro-actively checking whether the user is ready for a rename before a rename action is carried out. This means many PMRs avoided, more customer awareness, more customer confidence of our service, lesser customer hindrances/ frustrations/ pain etc."